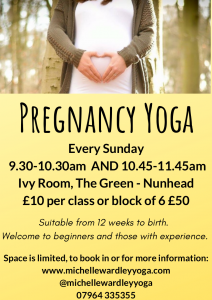 Pregnancy yoga in the beautiful and light Ivy Room starting on Sunday 6th January from 10am-11am (with time for tea afterwards) Classes are designed to slow it all down, make time for you and your baby, to work through poses to help strengthen and create space for your baby to grow and to encourage them into optimal birthing position, to learn breathing techniques for relaxation and to make new mum friends in your area. No need to commit to a block, you can pay for 6 classes and use when suits you- although coming every week would be the ideal! All props are provided. Welcome to complete yoga beginners, or those with experience. Contact me to book in, space is limited.